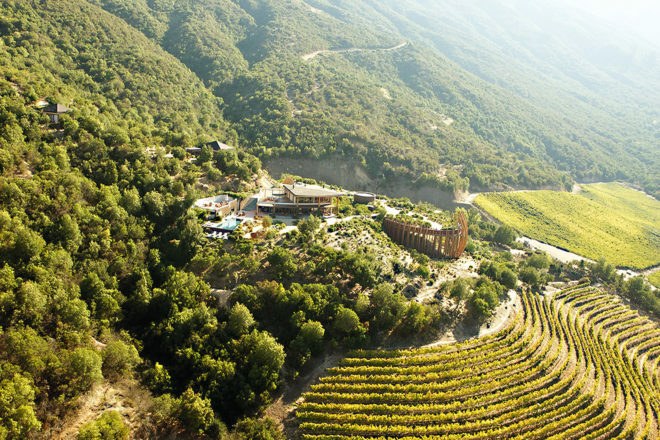 The verdant landscape of Colchagua Valley in Chile - home to the Lapostolle Residence. The lavish exterior of the Lapostolle Residence. 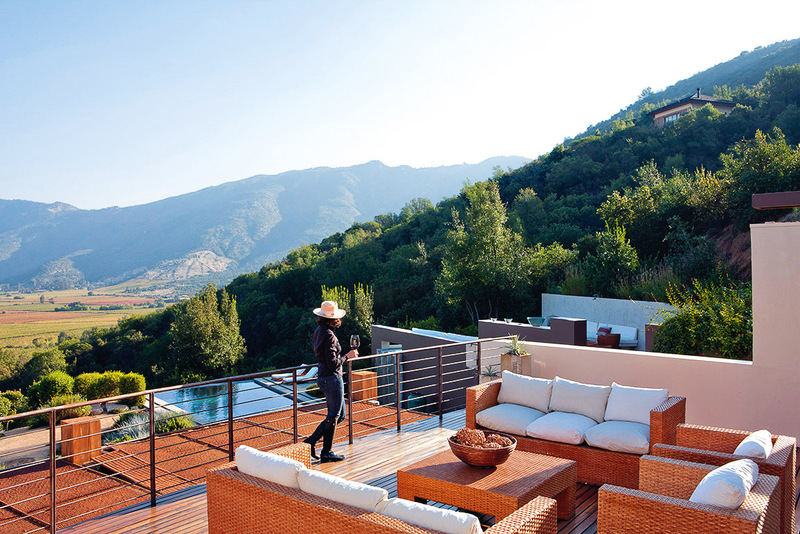 Overlooking the picturesque Colchagua Valley from Lapostolle's private balcony. There are times in one’s life to overcome any feelings of guilt and simply partake in the hedonistic pleasures of sheer indulgence! This was one of those times: I had booked two nights in one of the world’s finest and most respected vineyard resorts, Lapostolle Residence in Clos Apalta in Chile’s Colchagua Valley. Considered one of the best wine regions in the world, the Colchagua Valley is around two-and-a-half hours’ drive south of Santiago. Out of this poor soil rich things grow and as far as the eye can see merlot, cabernet sauvignon, petit verdot, shiraz, and carmenere vines thread their way across the Clos Apalta valley floor. They’re the lifeblood of Lapostolle and the world-famous wines it produces. Appearing to crown this verdant majesty, a magnificent bronze sculpture rises triumphantly upon the hill ahead of me. Rendered in reflective glass it mirrors the views of this family-owned vineyard, yet cleverly conceals the actual entrance to Lapostolle’s winery within. We drive past the sculpture to the Residence. Having arrived just before lunch, we are invited to relax alongside the infinity pool in a garden sketched with soft grasses and cacti. We’re visiting in summer when the dining tables are laid with relaxed elegance and set on granite flagstones overlooking the vineyard. We sip an aperitif, a Kappa Blue Star blended with blueberries and described as a “Pisco like no other” (a Chilean favourite which is usually a potent blend of grape brandy, lime, egg white and Angostura bitters). We are given a personalised menu of four courses (think Michelin-star quality) with four perfectly matched handcrafted wines to accompany each. It’s not just reds that are on offer; two superb whites from Lapostolle’s vineyards north of Colchagua, in Casablanca and Las Kuras, are also featured. All of the bottles remain on the table for us to enjoy at our leisure. Lapostolle Residence hosts a maximum of four couples at a time in four huge casitas or lodges. Nestled into the native forest hillside, each has a private terrace and garden and affords absolute privacy. The décor is inspired by the four varietals that make up the blend of Lapostolle’s iconic Clos Apalta wine. We are staying at the very top in the Carmenere casita; Carmenere is the name of a Bordeaux grape varietal which was brought to Chile before the onset of the phylloxera aphid which destroyed the vines in France. It is grown here in Colchagua. Our massive 90 square-metre lodge is all glass and pale honey coloured rauli wood, softened by the natural light and the lime colours in the silk and leather upholstery. It’s as heavenly inside as it is out, with the spacious surrounds, much like the views, seeming to go on and on. Time is precious here. The fan gently spins in the high arc of the ceiling and I choose not to close the automatic blinds at night so that I can wake and be greeted, in my bigger than king-size bed, by the sight of the early morning kissing the grape-laden valley beyond. Whether walking, sitting, bathing, swimming, eating, drinking, having a massage or practising yoga, there are breathtaking views across the Clos Apalta valley everywhere you look. Initially I’d imagined driving from Santiago to Colchagua’s main town of Santa Cruz and choosing some much more affordable accommodation, then joining one of the premium wine tours which operate in the area. But I kept returning to the highly prestigious and very tempting Relais & Chateaux property, Lapostolle, tempted by its awards – Wine Spectator’s World’s Best Wine for its Clos Apalta 2005 – and the outstanding reviews of its accommodation and food. In 1994 Madame Alexandra Marnier Lapostolle, great-granddaughter of the creator of Grand Marnier, and her husband Cyril de Bournet undertook a creative challenge with no expense spared, blasting tonnes of granite bedrock out of a sloping hillside in order to build a six-storey, gravitational, fully organic winery below ground. Today, a corkscrew shaped, spiral staircase of recycled granite curls down 25 metres below the stunning sculpture visible on the surface. It’s meant to resemble wine swirling in a glass. We take a private tour between lunch and dinner and taste the results of blending French expertise with the perfect Chilean climate, soil and conditions; Lapostolle’s Casa Grand Selection Sauvignon Blanc, chardonnay, and the blends borobo and Clos Apalta. Never have I felt quite so spoilt. If exercise is required between all the fine dining and wining, guests can choose from horse-riding, swimming or mountain biking. I decide to walk down through the vineyards to admire the organic fruit, vegetable and herb gardens before strolling on to the farm. Looking between the vines I am greeted with an endless chorus of “hola!” from the girls pruning the grapes. I check out the horses, chicken and a llama, and although I successfully tiptoe past the dozing dog, I accidentally scuttle the geese and ducks. I had been concerned about how my husband and I would manage breakfast, followed by four courses for lunch and the same again for dinner, complemented by four separate wines and, of course, a Grand Marnier liquor, but it was never an issue; something to do with pacing ourselves in the knowledge that at the Residence there was always something equally brilliant to come. It’s a definite ‘why not spoil yourself’ for couples who love to immerse in all-inclusive, relaxed luxury. 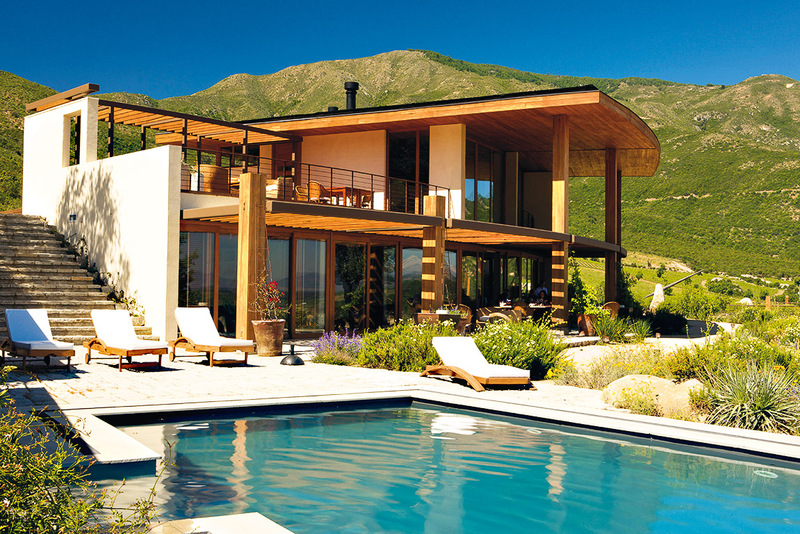 This intimate Chilean hideaway is all about the amazing, inspirational views, and it’s only a 10-minute drive to the Santa Cruz Museum. Where luxury shares a perfect affinity with nature. Walk, cycle or ride amongst the vineyards, past the organic gardens, to the farm. Generous and unpretentious warmth; we’re told “Treat this as your home”. You really are a special house guest. A huge WOW factor. A masterpiece in design makes for cool luxury. Wine and food lovers rejoice! I loved the exquisite courses paired with freely poured, incredible wines. Even though it’s approximately $1541 per night, per couple I recommend a two-night stay (or longer!). Lapostolle offers a chauffeured car from Santiago for $343 each way.